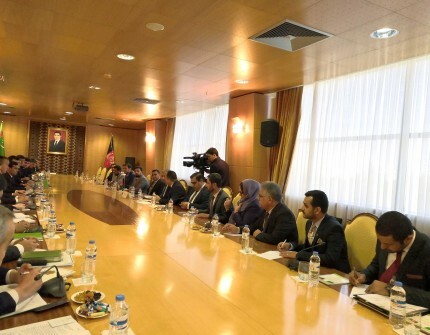 On November 1-2, 2018, the 7th meeting of the Intergovernmental Turkmen-Afghan Commission for Economic Cooperation was held in Ashgabat. The Afghan side was co-chaired by Mohammad Homayoun Qayumi, acting Minister of Finance of the Islamic Republic of Afghanistan. The agenda of the meeting, which was attended by the heads and leading experts of a number of ministries and departments of both states, included a wide range of issues relating to the priority areas for further partnership. During the meeting, the parties reviewed the development of the legal framework of cooperation between the countries. The participants also discussed the priority areas of cooperation in the trade- economic, fuel-energy, transport, construction areas and in the field of agriculture. The sides expressed their intentions in deepening relations in the cultural-humanitarian field and the development of cooperation in the spheres of science, culture, education, health and tourism. The meeting highlighted the role of the gas pipeline Turkmenistan – Afghanistan – Pakistan – India (TAPI), which is an important long-term energy project of political, social and economic importance for the participating countries. Within the framework of the meeting, the representatives of the railway organizations of the two countries held negotiations in the result of which the parties signed the Memorandum of Understanding on construction of the railway line for the sake of the development of Akina station. Also on the results of the work of the Intergovernmental Turkmen-Afghan Commission for Economic Cooperation, a final protocol was signed.